I’ve talked about how difficult I’m finding it to stop eating dairy products, so today I’m going completely the other way — I’ve made a list featuring five of the everyday substitutes I’ve found so far. All of them are easy to get hold of in supermarkets, which is for the best. Mostly because I can’t really justify weekly trips to my local Wholefoods (I just end up spending too much money on snacks. All the snacks). I found this vegan mayo in Morrisons by accident — it tastes pretty similar to regular mayonnaise, albeit with a thinner texture and less of a strong smell. I use it in sandwiches and to make homemade lime slaw (find the recipe here). My dad has been known to take this from the fridge and use it without noticing a difference, so make of that what you will! 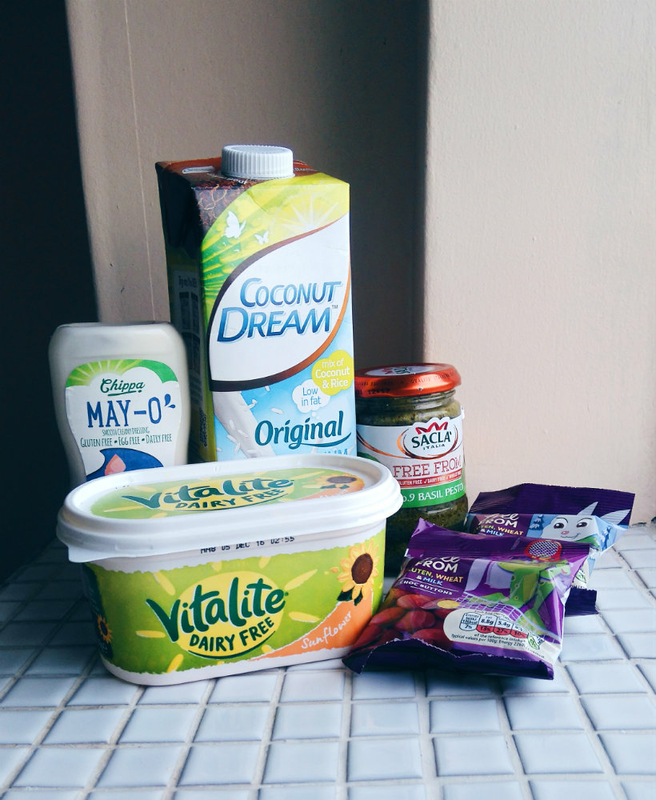 There are so many dairy-free milks out there, which is wonderful (check out Sarah’s comparison video for a taster) and my personal favourites are those with coconut in them, because I like the taste of, well, coconut. This milk is thinner and lighter than regular cows milk, with a sweet, nutty taste. I use it to make overnight oats — the ultimate lazy breakfast — and it also tastes good in a vegetable curry. Including pesto on a list of everyday foods is probably the most middle class thing I’ve ever done in my life, but I always have a jar in the kitchen. Pesto pasta with roasted vegetables is one of my favourite comfort foods, plus adding pesto to food just brightens it right up. This one contains tofu instead of cheese but it tastes exactly the same as the regular version, and I mean exactly. If you did a blind taste test then you probably wouldn’t be able to tell the difference between the two. VitaLite tastes like your standard margarine. It’s pretty good on toast (it melts right in) and can be used as a base for white sauce while cooking, although I’d suggest adding spices to get rid of the margarine flavour. What are your favourite dairy-free substitutes? Have you tried any of these? Let me know in the comments!